Effective October 3, 2016, our Visa Gift Cards will no longer be able to be used outside of the United States. Our gift card provider will no longer allow INTERNATIONAL PURCHASES with Visa Gift Cards. A Gift Card gives both the recipient and the gift card giver complete flexibility and convenience. The gift giver can choose a denomination, purchase the Gift Card and choose to have the Gift Card sent directly to the recipient, or sent to the gift giver. The recipient is able to use the Gift Card to purchase exactly what they want! No more gifts that are the wrong size, wrong color, or just plain wrong! Recipient can use the card anywhere Visa Debit is accepted including stores, restaurants and entertainment venues, or by using the credit option at a merchant. Gift Cards can be used in stores, online or over the phone. Gift Cards may NOT be used out of the country. Gift giver can give a gift that is exactly what the recipient wants. Recipient can choose where they want to use the card. Gift giver doesn't have to go from store to store looking fo just the right gift. A Gift Card eliminates the worries of losing a paper gift certificate, check or cash. You must know your balance at all times. You may call 1-800-244-5360 or go to www.harlandclarkegiftcard.com to review your transaction history and balance. 1. Click on the graphic of the Gift Card above and order the card online. Cards can be ordered via the Internet in amounts from $25 to $500 at a cost of $5.95 each. 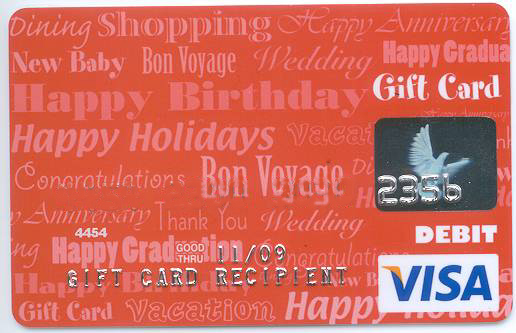 Visa Gift Cards ordered via the Internet can have the name of the recipient embossed on the card. 2. Visit our Card Services Department at the Credit Union to order your Visa Gift Card. Cards prepared at the Credit Union can be ordered in amounts from $25 to $750. Gift Cards ordered at the Credit Union cannot be embossed with the name of the recipient. The Visa Gift Cards are not reloadable. They have a 7 year expiration date and after 12 consecutive months of inactivity, a fee of $5.00 will be charged to the card. Inactivity fees can be charged only after a card hasn't been used for at least one year, and then only once per month. But fees may be charged to buy the card or to replace a lost or stolen card. The card must clearly disclose its expiration date, and the card or packaging must clearly disclose any fees. Read the fine print before buying. Is there a fee to buy the card? Are there shipping and handling fees for cards bought by phone or online? Will any fees be deducted from the card after it is purchased? Inspect the card before buying it. Verify that no protective stickers have been removed, and that the codes on the back of the card haven't been scratched off to reveal a PIN number. Report any damaged cards to the store selling the cards. be worth less than anticipated. another location where the card can be used. find out if they are redeeming the cards, or if they will do so at a later date. If the gift cards are displayed in an accessible location (on a rack in the store for anyone to access), take a card from the back or ask the clerk if they have any cards behind the register. Theives often write down card numbers of accessible unpurchased gift cards and create counterfeit cards. Ask anyone who gives you a card for its terms and conditions, the original purchase receipt, or the card's ID number. Keep this information in a safe place. Use gift cards as soon as possible, because it's not unusual to lose or forget about them. Treat a card like cash, and if it is lost or stolen, report this immediately to the issuer. Some issuers will not replace cards that are lost or stolen, while other issuers will, for a fee.